They will be transforming the Baths into an Enchanted Christmas Cinema where audiences will uncover magical decor, sparkling Christmas trees and festive tunes. Their resident DJ will be spinning all the Christmas classics and there will be food to relish from street food traders The Blue Caribou Canteen, Mac Daddies and Dim Sum Su. 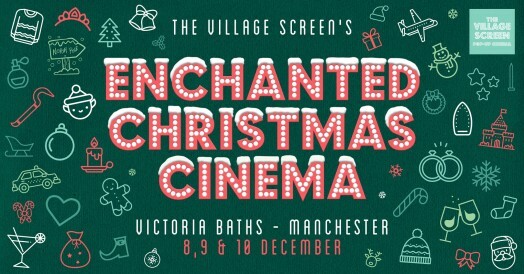 The Village Screen Bar will be open serving delicious Christmas-themed cocktails, beers by Thornbridge Brewery, wines, Prosecco, mulled wine, soft drinks and a selection of cinema snacks and hot drinks. They will be providing heating but the building is cold so audiences are encouraged to snuggle up with hats, gloves and blankets for a magical Christmas experience inside a unique location. Tickets go on sale at midday on Wednesday 15th November and can be purchased HERE along with more information about the event, ticket prices and terms and conditions.